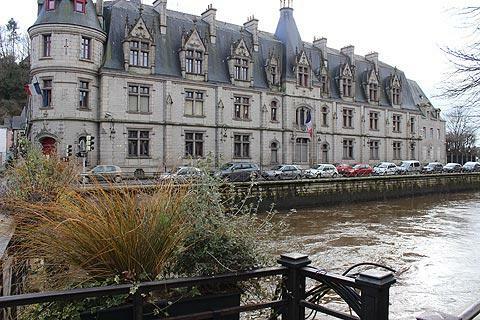 Quimper is a popular and interesting town in south-west Brittany, and it is the capital (prefecture) of the Finistere department. The town is also in an attractive setting, in a pretty valley at the confluence of the Odet and Steir rivers. 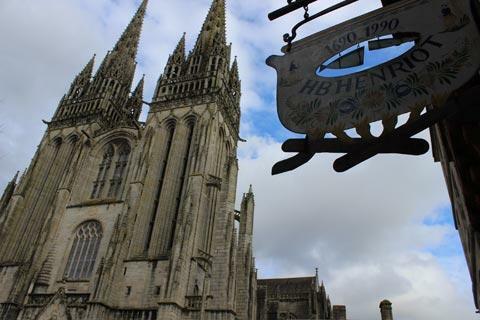 Although the history of Quimper dates back to roman times it was in medieval times that the town became an important regional centre. The town became wealthy from the 17th century onwards due to and the growth of the pottery making industry here. 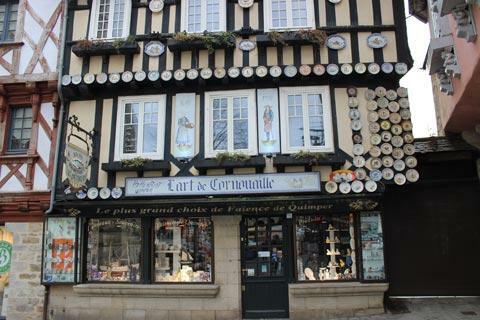 This long tradition of pottery making can be seen with lots of 'Quimper faience pottery' for sale with its trademark pattern as you explore the streets. We found a lovely plate, but the shop said it was 300 years old and cost £750. We didn't buy it! 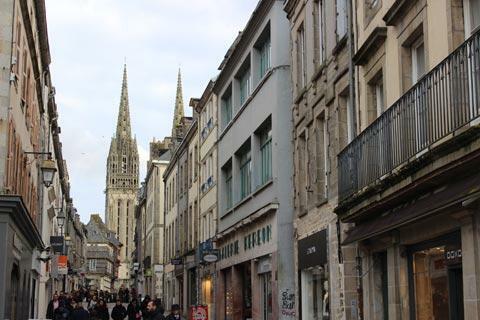 Quimper has quite a large historic centre and plenty to explore - a visit is recommended when you are in this part of Finistere. Your visit will almost certainly start in the large square in front of the cathedral, Place Saint-Corentin: this is the eastern end of the old town and within easy reach of all the most important attractions. Most of the historic centre is pedestrianised making it very pleasant and safe to explore. 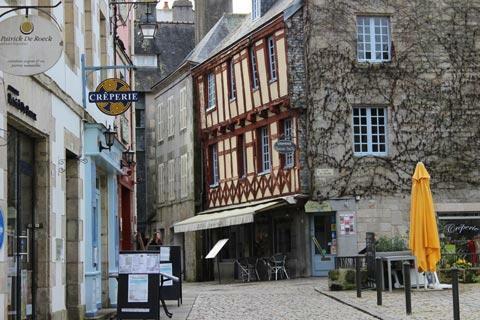 The cobbled streets and paved squares in the old town to the north of the River Odet - the large river that runs through the heart of Quimper - and around the smaller Stire River that joins the Odet in the centre of town are where you will find the most interesting buildings and sights. You will come across numerous medieval half-timbered buildings as you explore and several small bridges across the river. Among the most interesting roads in the centre to see medieval houses are Rue Kéréon (straight down from the front of the cathedral) and arround the Place Terre au Duc (take the Rue de la Herse off Rue Kéréon), with others also to be found in the streets in the historic centre around the cathedral. 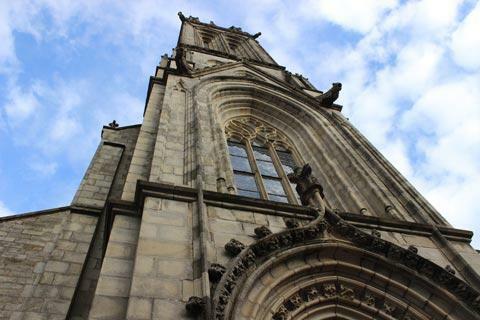 The Cathedral of Saint-Corentin is in the gothic style and dates from the 13th - 16th centuries. It is both the oldest and the largest building of its type in Brittany. The facade and the stained glass windows are among particular highlights although you should be aware that the stained glass windows and the two spires that dominate the front of the cathedral were only added in the 19th century when substantial renovations were carried out. To the right of the Cathedral there is another important historic monument: the Palais des Eveques was built in the middle of the 17th century and for several hundred years was home to the local bishops. On Rue des Douves, the north-east edge of the old town, you can also see parts of the original defensive walls for this region which was known as the Ville Episcopale. 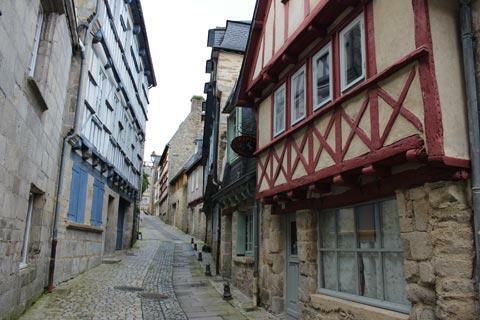 The old town further to the west, beyond the Steir River, is known as the Ville des Ducs de Bretagne. 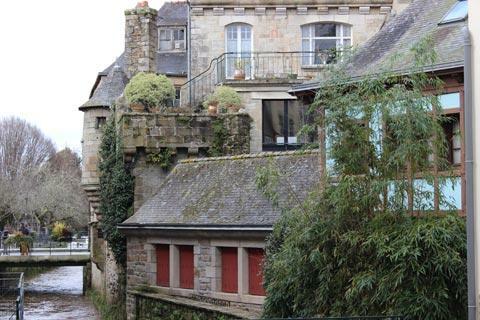 There are more paved streets to explore, around the attractive Place Terre au Duc, and the Ursulines Convent is the main historic monument in this part of Quimper. There are lots of pleasant small restaurants and creperies in the old town, which is largely closed to cars, where you can take a welcome pause from exploring. One of the best places to find these restaurants, epecially if you are looking for crepes which are remarkably popular in Brittany and come in every type and flavour imaginable, are in and around the Place au Beurre: follow Rue Elie Freron north from Place Saint-Corentin then left after 100 metres on Rue du Sallé. 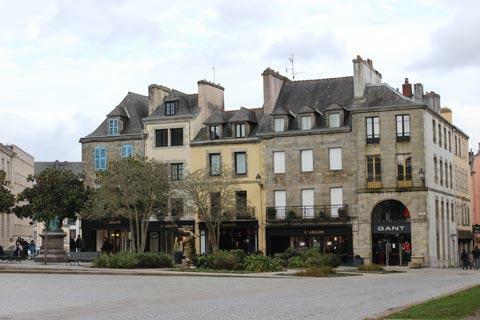 Place au Beurre is also very pretty so take a look even if you are not searching for a creperie! If you are looking for art and culture you will enjoy visiting the Quimper Museum of Fine Arts (Musee des Beaux Arts) on the north side of Place Saint-Corentin which has some interesting paintings by local artists (including those from the so-called Pont-Aven school of painting); and the Museum of Breton History (next to the cathedral in the Palais des Evêques) also has some interesting exhibits about the history of the town and region. 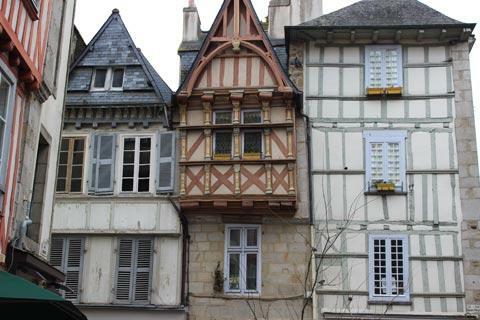 There is also a covered market in the centre of Quimper which is lively and popular, and open every day except Sunday. After exploring the historic centre you can also take a stroll along the River Odet. Although the buildings here are less ancient it is a pleasant walk and you can also see the imposing renaissance style Hotel de Préfecture on the south side of the river, built around 1904-1910. This is a convincing Renaissance style building: although it is largely based around a concrete structure you never would have guessed if I hadn't told you! We also liked the Theatre Max-Jacob on Boulevard Dupleix which is another interesting example of architecture in Quimper from the beginning of the 20th century. To discover more about the local pottery industry you can follow the Odet downstream a little way to the Locmaria part of Quimper (still on the southern side of the river). Locmaria was historically the region of the town where pottery was produced and is the oldest part of the town. 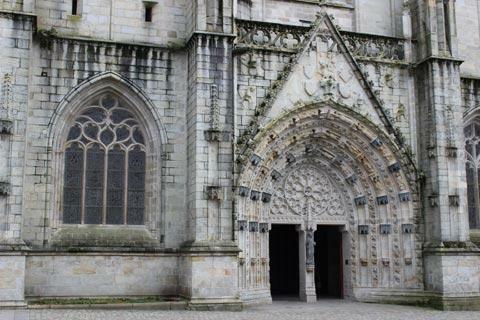 Highlights here include the church in Locmaria, built in roman style in the 12th century and the oldest church in the Quimper region, and the 17th century priory. The cloisters and the priory garden are both very pretty and well maintained, then you can visit the Museum of Faience to see impressive examples of the local pottery. Note: on the southern side of the River Odet you will also find a good selection of cafes and restaurants on and around Rue Sainte-Catherine which we thought offered good value for money and were less visited by tourists than those in Quimper old town, and still with 200 metres of the cathedral. If you have time it is worth following the footpath up Mont Frugy for a birds eye view of the town. 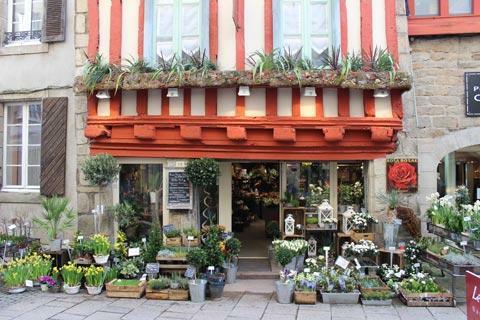 Also nearby don't miss the beautiful village at Locronan to the south-east of Quimper.